Throughout Irish history, rebellions were always failures because of cowardice, drink, and most ominously, informers. Returning from Frongoch Prison in Wales with the other survivors of the failed 1916 Rising, Michael Collins realised this. Britain had always been able to either place spies in rebel parties or else succeed in enticing Irishmen to ‘rat out’ their colleagues for money and protection. With his own intelligence network, he took on, and beat, Britain at its own game. Michael Collins was appointed the Director of Intelligence of the Irish Volunteers in January 1919. By this time, he had already laid much of the groundwork for his intelligence network. Collins had penetrated the Irish and English postal, telephone and telegraph systems. Letters and dispatches could be moved to various contacts by certain train inspectors. The railway workers were organised so effectively that the military frequently had to move troops and stores by road, which would play into the hands of the IRA ambushes as the war intensified. The trade unions were mobilised to hamper police and military movements by road, rail and sea. For many months the army had to tie up thousands of men on the major ports as the dockers had paralysed all attempts to land stores. One of Collins’ key activities was gun running. 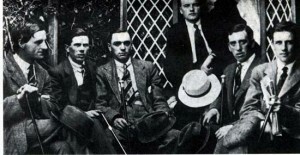 He established a network of agents across the British Isles using his IRB (the Irish Republican Brotherhood) connections. His secret channel was dubbed the ‘Irish Mail’. Gelignite from Wales and England came carefully packed in tin trucks, rifles came in wicker hampers, revolvers and ammunition in hand luggage. In December 1918 a munitions factory was set up in the cellar of a bicycle shop in Dublin, with Collins taking over the operation of it several months later. The most important event in 1918 for the intelligence network was Collins’ meeting in March with Detective Ned Broy of the DMP (Dublin Metropolitan Police). The police in Ireland was divided into the RIC (Royal Irish Constabulary) throughout the country and the DMP in Dublin city. Broy gave Collins a detailed, inside knowledge of the British police system in Ireland. He learned how the system worked and how the police were trained. Particular attention was paid to the special ‘G’ division of the DMP, whose job it was to keep watch on any national movements. Anyone suspected of being an agitator had an ‘S’ placed after their name and their movements were followed by the ‘G’ Men. Each ‘G’ man transferred his files every night to ‘a very large book’, of which Broy had access to. Collins was from then on able to get a copy of every secret file that went into the very large book. As well as Broy, Collins got in contact with two other detectives who were based in Dublin Castle. Collins set up an intelligence office at 3 Crow Street over a print shop. Liam Tobin became the Chief Intelligence Officer. The office’s initial task was to gather as much information as possible about the DMP, especially ‘G’ division. Collins continued to recruit agents for his intelligence network. The chief clerkess at British military headquarters in Cork provided a vast amount of information on raids, spies and informers. A typist in Dublin Castle supplied information concerning field security and counter-insurgency operations, as well as personal details of British intelligence officers. On April 7th 1919, Detective Broy smuggled Collins into the Detective Headquarters in Brunswick Street, where he spent the entire night going through police records. Collins was the first Irish revolutionary to have the entire modus operandi of the British police in Ireland laid out before him. On April 9th, a new and bloodier phase of the intelligence war began. Acting on Collins’ orders, a number of ‘G’ men were warned by the Volunteers against an excess of zeal. ‘G’ men who did not comply would pay with their lives. Strict rules were laid down for Squad shootings. Assassinations were a last resort, coming after repeated warnings to the target. Once the order to shoot was given, the Squad would study the locale carefully and work out where and when the shooting would take place. After a job the guns would be dropped in the pockets of ‘the Black Man’, a former boxer who perpetually walked the streets of Dublin. The other main result of these killings, and Volunteer activity in Munster, was the banning of Sinn Fein and Dail Eireann. This created a fertile climate for Collins’ extremist tactics, allowing him to assassinate more British police and agents without being restrained by moderates. Following Redmond’s death, his own undercover detectives pulled out and returned to Belfast, and thereafter ‘G’ Division “ceased to affect the situation”, according to British military intelligence. By the following month, a Secret Service Branch of the RIC no longer existed. 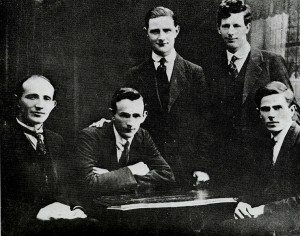 The Squad was officially established at 46 Rutland Square on the 19 September 1919. Paddy Daly (Paddy O’Dalaigh, sometimes said to have succeeded Mick McDonnell as leader, but usually considered as leader; he became a major general in the national army). Sean Doyle and Joe Leonard (came right behind Daly in the chain of command. 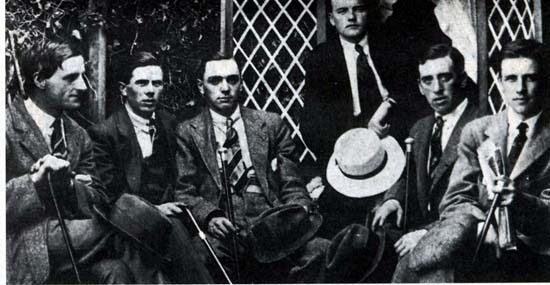 Other original members were; Mick McDonnell (decribed by some as the first leader). Charle Byrne (a Dubliner called The Count because of his cheerful mien in all situations) Eddie Byrne. Three spies came close to getting Collins caught at this time. One was a pretend Marxist sympathiser who Forbes Redmond was using to get to Collins, but once Redmond revealed the spy’s true intentions in Dublin Castle, word got out to Collins who promptly dealt with the spy. Another was a former Irish P.O.W. from Germany in World War I, who double-crossed Collins to get money from the British police. The Cork Volunteers executed him. The third spy offered to buy arms for Collins, but his true purpose was discovered, and he was shot dead by the Squad in broad daylight. Early 1920 saw several more successes for Collins’ intelligence network. Collins had established a system of meeting his various agents regularly at a house in Clontarf. The keys to police and official cipher codes were ascertained, and over time a system was developed to decode official British police and military messages. A clerk in the RIC fed Collins with information and codes from the RIC headquarters, as did an RIC Sergeant stationed in Belfast. One of his agents managed to get into the British Secret Service, and was able to introduce some of Collins’ intelligence officers to Secret Service men. The Resident Magistrate who had opened a much publicised inquiry into Sinn Fein funds was dragged from a tram and killed on March 26th. On April 3rd, tax offices throughout the country were fire bombed, on Collins’ suggestion, to disrupt the British tax collecting apparatus. By this time, IRA units in various parts of Ireland were shooting policemen. In one day, 350 unoccupied RIC barracks were burned down. Resignations in the police force were running at more than 200 a month at the start of 1920. The IRA appeared to be succeeding in taking over the country. But Britain would fight back. On February 24th 1920, a curfew was introduced from midnight until five o’clock in the morning. British policy in Ireland would become more hardline, with the army and police operating a ‘shoot-to-kill’ policy and areas sheltering IRA fugitives to receive economic punishment. In practice, this meant burning, looting and shooting up towns all over Ireland. The Black and Tans first arrived in Ireland on March 25th. They were fairly undisciplined ex-British army soldiers, mainly from World War I, here to undertake “a rough and dangerous task”. In September, they were joined in the country by the Auxiliaries, ex-officers from the British Army. Both sets of soldiers joined the regular army and the RIC in combating the IRA. Collins knew that it was only a matter of time before he was finished. But just as it the British Secret Service were closing in on Collins, Collins was closing in on them. The sister of an IRA man told her brother that some of the gentlemen in the house spoke with English accents, kept odd hours and went out after curfew. A DMP man secured the names and addresses of these Secret Service Officers. Collins was able to obtain room keys for all their houses as a result. Detailed reports were prepared on each agent. Sunday, November 21st was chosen for the date to strike against these agents. Shortly after eight o’clock that morning, groups of Volunteers and members of the Squad converged on eight different addresses in Dublin. Nineteen British soldiers were shot dead. In reprisal, the Black and Tans opened fire on the crowd watching the GAA match at Croke Park. Fourteen people were killed and hundreds were injured. A week after Bloody Sunday, seventeen Auxiliaries were killed in an ambush by the IRA in Kilmichael, Co. Cork. That same day, partly through Collins’ organising, the British-based IRA fire-bombed more than a dozen warehouses in the Liverpool docks area, causing millions of pounds worth of damage. The British government, whether it would admit it publicly or not, knew that the IRA were far from surrendering. On December 20th, Eamon de Valera returned from America. De Valera argued that it would be better to change from hit and run guerilla tactics to having a series of battles with the British, mainly for propaganda purposes. This resulted in the burning of the Customs House on May 25th 1921. It was a publicity success worldwide but resulted in many of the best IRA men in Dublin at the time being captured. As the summer reached its peak, Collins had been preparing to assassinate around sixty fresh agents sent in from Britain, as well as groups of soldiers who were based in Dublin. Half an hour before this operation was due to begin, it was called off. Lloyd George had sent word that he wanted peace. This didn’t stop him continuing to run his intelligence office as the truce was maintained. A truce it had in no small part brought about. Several things forced the truce of July 1921, of which Collins’ intelligence network is only one. But it is arguably the most important one. One of the key reason that the War of Independence of 1919-1921 actually achieved a tangible result (the Anglo-Irish Treaty), unlike scores of previous rebellions, was intelligence.